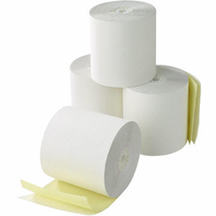 TST/IMPRESO, INC. offers inline printing, slitting and packaging systems for single ply bond and thermal rolls. State-of-the-art printing with low minimums and without the costly set-up fees normally associated with custom printing. A custom tailored receipt offers a powerful and professional marketing tool. Promote a better company identity, brand awareness and offer special promotions targeting specific geographical areas. Customers are able to add company logos, special messages, coupons, return & exchange policies, upcoming sales, and customer surveys. Artwork assistance and development is offered at no additional charge. Additionally, we are able to match a wide variety of ink colors, including the latest security inks. Request a printed receipt quote today!